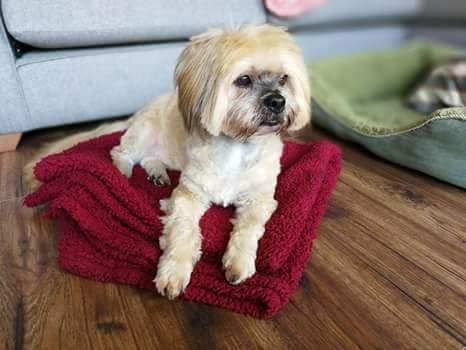 Oscar is a 10 year old male Lhasa Apso. Grumpy old man seeks like minded grumpy dog owner! Oscar is a dear little chap in many ways, he loves his wanders and having a good sniff, He loves to play with soft toys and he loves his food! Oscar needs an adult home without children visiting. Oscar gets on well with other dogs and really enjoys the company of others. He could go with dog savvy cats but he does love abit of chase! Oscar is good to groom until you get to his toes! Oscar takes his time to settle in and will be wary of new people to begin with, he has his quirks and his tell tail signs that hes not impressed. Oscar has a few lumps and bumps but on the whole hes a very healthy chap.